PT Pegadaian (Persero) - Pegadaian is a long standing state-owned financial services company in Indonesia which was formed since 1746. Pegadaian has core business competencies in pawning loan services. The history of Pegadaian goes back to 1746 when Vereenigde Oostindische Compagnie (VOC or The United East India Company) established Van Leening Bank as a financial institution that provides credit with a pawn system. Established the first state-owned Pegadaian in Sukabumi West Java on 1 April 1901. After several times changes of its status, the name of PT Pegadaian (Persero) officially launched in 2012. 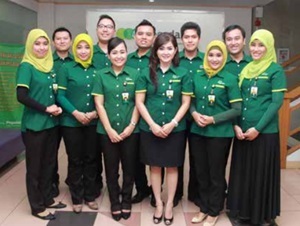 Based in Jakarta, Pegadaian has a monopoly on fiduciary service in Indonesia. Pegadaian has its business activities focused in three sectors: financing, gold and various services. In term of financial performance, Pegadaian has recorded a positive financial growth and satisfactory performance in the business year of 2016. Pegadaian booked total asset of Rp 46,873.89 billion in 2016 or increased 19.7% year-on-year (YOY) from Rp 39,157.96 billion in 2015, according to information found in PT Pegadaian (Persero) Annual Report 2016 as cited by JobsCDC.com. Referring to its annual report, Pegadaian registered a 8.67% growth in total operating revenue in 2016 value of Rp 9,708.06 billion as compared with Rp 8,933.34 billion in 2015. Total net income for current year 2016 went up by 14.02% YOY from Rp 1,938.43 billion in 2015 to Rp 2,210.25 billion in 2016. Familiar with browser testing and debugging. Have good understanding of entire web development process (design, development and deployment). Have good understanding of layout aesthetics. Have good knowledge of SEO principles. Familiar with software like Adobe Suite, Photoshop and content management system. Able to do authentication, database operation, logical design. Able to develop API Service. Able to manage front end integration with server and manage query. Able to do trouble shooting and debug application. Mastering in programming language in Java, Java Script, PHP, SQL, & React Native. JobsCDC.com now available on android device. Download now on Google Play here. Please be aware of recruitment fraud. The entire stage of this selection process is free of charge. PT Pegadaian (Persero) - Front End Programmer, Back End Programmer Pegadaian February 2019 will never ask for fees or upfront payments for any purposes during the recruitment process such as transportation and accommodation.